The weekend of the 7th/8th June saw the inaugural Towcester Food and Drink festival which was held at Towcester Racecourse. This was the first time I’ve been to the venue and the sunshine was out in force after the mid morning thunder storms. This event was extra special because one of our family members had his homemade cider on sale after receiving the seal of approval from the organiser of the event. Situated amongst the iconic Racecourse there were plenty of Food Tents showing off a fine selection of locally produced produce including cheeses, cakes, pickles and spices. There were cooking demonstrations and live music creating a varied number of things to see and experience. At the Champagne Bar Andy had his Cider on sale. His dry cider was called “Two Faced” which came in at a tasty 6.5% ABV. This was a truly awesome achievement, one that we are all extremely proud of. On the Saturday Andy sold just over half of his bottles and the remainder were cleared out by the large crowds on Sunday. Up against some well known and established local Ciders, Andy held his own and looked very much at home next to them. 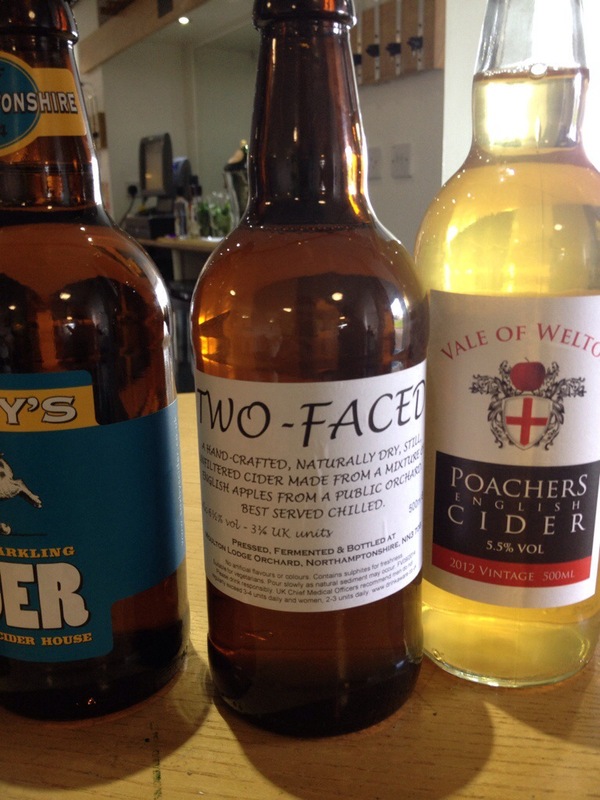 Selling at £3.50 a bottle I asked a couple of people who purchased Two Faced what they thought of his cider. One guy joked when I asked him how he found the cider, he replied by saying in the bar through that door. He must have thought I was trying to sell him life insurance! A very funny line if ever I heard one. The evening saw us take part in the Towcester Food Festivals “Real Ale Trail” the event allowed customers to purchase a glass tankard and visit five local pubs/restaurants to try out new ales. These were provided by Crispin who had organised the festival over the weekend. For £7.50 we were set to have 5 x free quarter pints followed by another half at the Towcester Mill Brewery, our new tap house. We had some great tasters of Golden Ales and some Darker Ales. Sadly one venue didn’t buy into the spirit of this event. The Plough is a pub we have not visited before and it’s safe to say the way they made us feel as we entered the venue was not pleasant. They told us that they had sold out of the Ale and were not prepared to give us an alternative. Apparently according to the rather bullish lady who greeted us “they weren’t big enough to give us another option” the near packed front bar was a very poor alibi to her claim. Needless to say I’d like to thank the barman at The Brave Old Oak who had ran out of Pitstop (Silverstone Brewery) who gave us a couple of other options, thank you. The numbers taking part suggested that there was a good take up on the offer to sample local Real Ales, so that was a positive. I would also like to thank The Dolphin Cafe who made us feel extremely welcome in comfortable surroundings. The evening concluded at our new local tap house, the Towcester Mill. 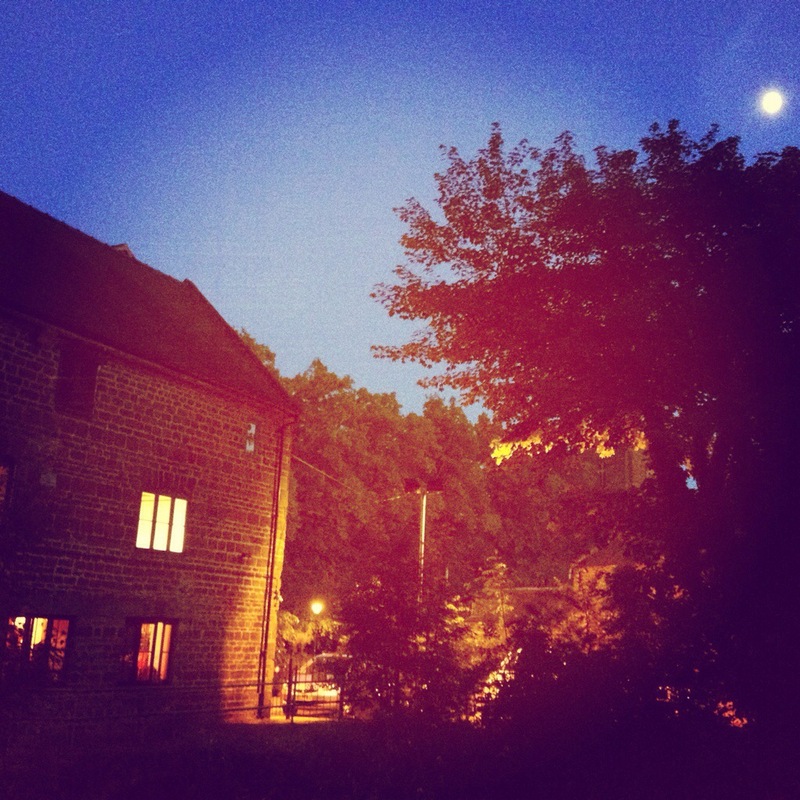 As we arrived at a packed Towcester Mill we were able to sit under the moonlight amongst the peaceful fields the Mill is set within. The odd bat flickered across the moons beams in a lovely tranquil atmosphere. This was certainly the best place to conclude this night and we enjoyed the last hour in the bar as the temperature started to drop. This is our new favourite pub and one place we will certainly be enjoying our weekend evenings in. I would like to thank Crispin for an amazing food festival which has put Towcester on the map. I would also like to congratulate Andy on his successful debut launching Two Faced. It has been a pretty decent experience, The Plough aside!